Chiropractics, the headache patient, and the lost art of touch. Figure. 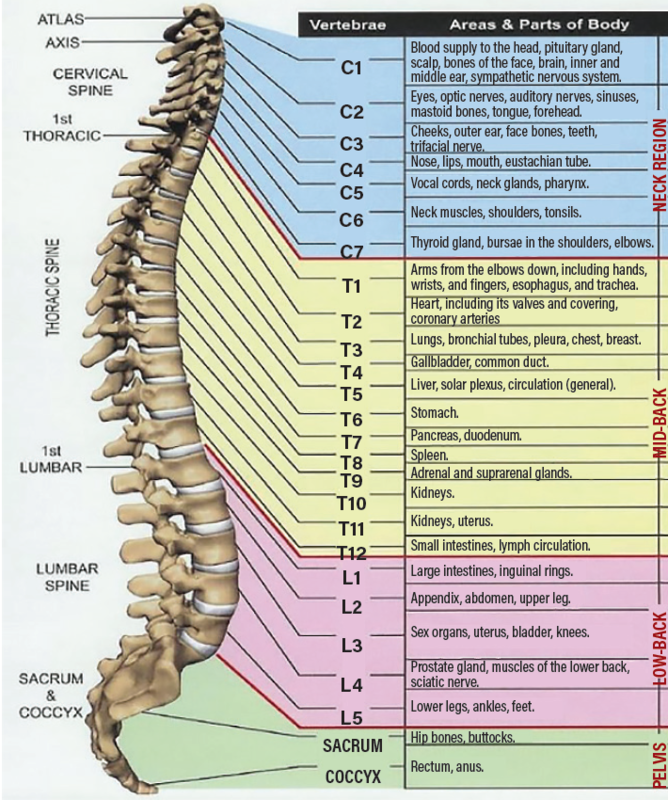 Chiropractic chart of viscera supplied by vertebral nerves. In 1895, with several spectators gathered and to great fanfare, DD thrust his clutched hands so forcefully into his patient’s thoracic spine that all present heard the alarming and audible crack. The patient, a janitor who serviced DD’s office, was middle-aged, stooped, and habitually complained to DD about his hearing loss—telling him that one day his hearing was sharp as a barn owl and the next he was deaf as a box turtle. Weeks before the dramatic crack, DD had observed that the janitor’s spine seemed bent, as DD would later write, to “an ungodly angle.” Palmer wondered if there could be a connection between the janitor’s deafness and his bowed backbone? DD had been considering the spine and its relationship to health and posited that there existed a spiritual (ie, God-given) life force or innate intelligence within the human body flowing from brain to spinal nerves to liver, kidneys, stomach, and other organs (including the hearing apparatus of the ear), supplying nourishing energy (Figure).2 Although without evidence, DD further postulated spinal subluxations (ie, vertebral misalignments) hindered flow of vital spirit, and that reducing subluxation with vigorous manipulation (a high-velocity, low-amplitude thrust) could restore this flow. The next day, when the janitor commented his hearing had “somewhat improved,” DD knew he was onto something big. Cobbling together notions from magnetism, vitalism, bone-setting, and other fringes of pseudoscience, and borrowing the Latin words chiros and practis—meaning done by hand—DD found commercial success better than any healing magnets or elixirs he had sold out of his wagon. Chiropractic was born. Modern science tells us that there is no nourishing vital force flowing from spinal nerves to organs, without which they would not survive—for example, a transplanted liver functions well completely devoid of innervation. Although DD Palmer believed that “95% of human disease” comes from spinal-subluxation problems, we know now that human maladies are caused by myriad scientifically provable causes among them infectious, autoimmune, degenerative, genetic, nutritional, and other etiologies.3 There is ample anatomic evidence that no neural path connects the spinal cord or nerve roots to the ear. Although spinal subluxations exist, they do not interrupt innate intelligence, nor are they reduced by chiropractic manipulation. Quite simply, DD’s crack of the janitor’s back could not have restored even a modicum of hearing. A scientifically rigorous review of contemporary research concerning chiropractic is both brief and disappointing. There are few well-designed studies, in part because the discipline was quite antiscience until the 1970s, and the only positive objective result is that it may be helpful for acute musculoskeletal low back pain.4 Chiropractic appears to be roughly equivalent to physical therapy, or a sheet of back stretching exercises, and possibly slightly superior to nonsteroidal anti-inflammatory drugs (NSAIDs). That’s it. Chiropractic does not treat asthma, ear infections, bed wetting, anxiety, irritable bowel, autism, attention deficit hyperactivity disorder (ADHD), or any other nonmusculoskeletal condition, despite many practitioners’ website proclamations. Although neurologists and headache specialists may not be enamored of chiropractic, it seems our patients are. 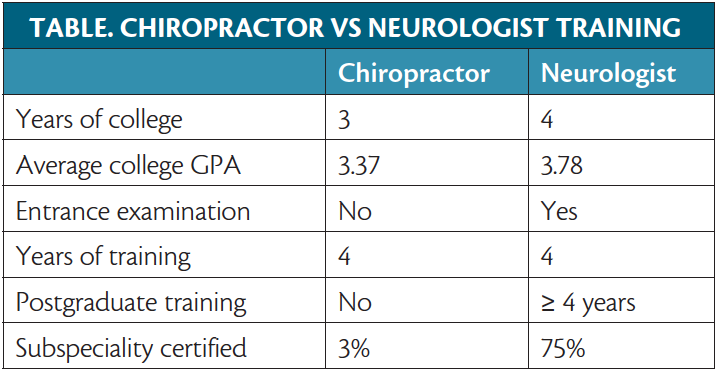 There are more than 77,000 chiropractors in the US treating more than 35 million annually (~12% of the population),9 vs approximately 17,000 neurologists, 500 board certified in headache medicine by the United Council on Neurologic Subspecialties (UCNS). There are 10,000 chiropractic students in 18 accredited schools and 2,500 new chiropractors and1,500 chiropractic assistants annually. Differences in training and qualifications abound (Table). The US Bureau of Labor predicts chiropractic will grow by 16% by 2026, because, as the Bureau’s website states, “The field is attractive to patients because chiropractors use nonsurgical treatment methods and do not prescribe drugs.”10 Many people go to chiropractors seeking chronic pain relief that includes migraine and other headaches. Simply put—chiropractors see our patients. It is reasonable to ask why patients go to chiropractic, despite an overwhelming lack of evidence to support its use in all but a select group of patients with low back pain. Chiropractors aggressively market themselves as a safe alternative to traditional medicine. Unlike allopathic medical schools, chiropractic students are taught marketing, finance, and business operations from the beginning of training. There is a specific emphasis on what it takes to get patients in the door—and keep them coming. Many chiropractors market themselves as primary care doctors, capable of providing health care to the entire family from infancy through end of life; there have even been cases of intrauterine chiropractic manipulation!11 Although marketing a chiropractic practice as a primary care provider may be a good way to build up a patient base, not everyone agrees with that model; some chiropractors, for example, are antivaccination proponents. Many musculoskeletal conditions resolve over time, without intervention. If patients have less pain after a few visits, they may assume chiropractic manipulation was responsible, when it may have been nature taking its course. To be fair, the same could be said for visits to physicians or physical therapists. Perhaps the chiropractor’s most valuable tool is neither their ill-proven gadgets—thermal analysis and wobble chairs come to mind—nor their unnecessary whole spine x-rays, but rather their hands, for to lay hands on a patient is to establish a human connection, vital to the doctor-patient relationship. Chiropractors lay hands on patients, instantly establishing a primal connection that has the unspoken power to engender goodwill and contribute to a heightened sense of well-being, or even the perception of being “healed.” Traditional allopathic medicine seems to have all but forgotten this ancient healing art of touch, busy as we are ordering high-tech tests and clicking and box ticking on our computers, attending to an “iPatient” in a machine, but leaving the real patient out in the cold. Several months ago, I was rounding with a new medical student and observed that after seeing 10 patients, she had declined to shake hands with any. I gently asked if there was some reason, cultural, hygienic, or otherwise, for her lack of participation in this ageless form of greeting. To my surprise, she informed me that at her medical school they were taught not to “violate the patient’s personal space.” A handshake, apparently, was a violation of personal space! How should neurologists respond when asked about chiropractic by our patients with headache? Should we weigh in vociferously, or adopt a neutral stance and demur? Should we, as it were, “grow backbones” and review the lack of evidence and even the potential harm of cervical manipulation? Like most things in life, there are shades of gray. Some chiropractors have abandoned the prescientific subluxation theory and no longer perform spinal manipulation. These practioners, termed mixers—as opposed to those still holding on to subluxation theory, called straights—are more likely to perform safe joint mobilization and deep tissue manual therapy, much like a physical therapist or osteopath and work on exercise, sleep hygiene, and nutrition. These chiropractors may be helpful to a select group of headache patients with significant myofascial pain, poor posture, and cervicogenic headache. It is still important to check them out thoroughly because some mixers still engage in pseudoscience (eg, as ozone therapy, homeopathy, or chelation). It may be even more useful to ask patients why they want to go in the first place. You may be surprised when a patient tells you it’s because you have not laid hands on him or her. You have not palpated the pain, carefully observed and manually scrutinized the injured area, percussed the region, mined deeply the muscle spasm. In other words, you have not fully done your job, and chiropractors, whatever their shortcomings, touch, push, prod, and crack. They lay hands on aching areas, while we, most often, do not. Neurologists need to rediscover the lost art of human connection. We may find our patients stick with us, and remember, in this age of rampant physician burnout, touch is reciprocal. Rediscovering the empathy conveyed by touch may be just what the doctor ordered, for patient and physician alike. Abraham Verghese coined the term iPatient—the one who resides in the electronic medical record displayed on our laptop. Often, he says, the iPatient is doing just great—all i’s dotted, all t’s crossed—while the living, breathing patient sits ignored, alone, and abandoned. Our specialty must recommit to this physical patient through eye contact, emotional engagement, and fostering trust and empathy through touch. Noted psychiatrist Leo Buscaglia wrote that, “Too often we underestimate the power of a touch, a smile, a kind word, a listening ear, an honest compliment, or the smallest act of caring, all of which have the potential to turn a life around.”15 We neurologists, for the good of our patients, our discipline and ourselves, must reconnect with our real patients on a human level, and deemphasize the iPatient—that string of 0s and 1s careening inside our computers who care not one whit about us. Despite the finest technology science has to offer, medicine is still a fundamentally human endeavor and must be done, at least in part, chiros practis—by hand. 1. Horton, Loren N. Palmer, Daniel David. The Biographical Dictionary of Iowa. Ames, IA: University of Iowa Press; 2009. 2. Coulter I. The chiropractic paradigm. J Manipulative Physiol Ther. 1990 Jun;13(5):279-287. 3. Novella S. Chiropractic, a brief overview: part I. Science-Based Medicine. https://sciencebasedmedicine.org/chiropractic-a-brief-overview-part-i/ . Published June 9, 2009. Accessed December 15, 2015. 4. Singh, S and Edzard, E. Trick or Treatment – the Undeniable Facts About Alternative Medicine. New York, NY: W.W. Norton & Company; 2008. 5. Ernst E, Canter P. A systemic review of systemic reviews of spinal manipulation. J Royal Soc Med. 2006;99:192-196. 6. Ernst E. Adverse effects of spinal manipulation: a systematic review. J Royal Soc Med. 2007;100(7):330-338. 7. Reuter U, Hämling M, Kavuk I, Einhäupl KM, Schielke E. Vertebral artery dissections after chiropractic neck manipulation in Germany over three years. J Neurol. 2006;256:724-730. 8. Law M, Ma WK, Lau D. Cumulative radiation exposure and associated cancer risk estimates for scoliosis patients: impact of repetitive full spine radiography. Eur J Radiol. 2016;85(3):625-628. 9. American Chiropractic Association. Patients. Why Choose Chiropractic. https://www.acatoday.org/Patients/Why-Choose-Chiropractic. Updated November 16, 2017. Accessed December 13, 2018. 10. United States Department of Labor Bureau of Labor Statistics. Occupational Outlook Handbook. https://www.bls.gov/ooh/healthcare/chiropractors.htm. Accessed November 2018. 11. Germanis A. Chiropractic for all ages from in-utero to birth. Healthycells Magazine, 9/2/2017. 12. Verghese A. A doctor’s touch. TED talk 2011. https://www.youtube.com/watch?v=sxnlvwprf_c. Accessed October 2018. 13. Goldstein P, Weissman-Fogel I. Brain-to-brain coupling during handholding is associated with pain reduction. PNAS. 2018;115(11):e2528-e2537. 14. Singh C. Touch in the consultation. Br J Gen Pract. 2012;62(596):147-148. 15. Buscaglia L. Born for love–reflections on loving. New York, NY: Fawcett Books;1992. Targeting risk factors may decrease vascular cognitive impairments. The standard of care for acute ischemic stroke with large vessel occlusion continues to evolve. When should neuropsychologic tests be ordered and what questions should testing answer? 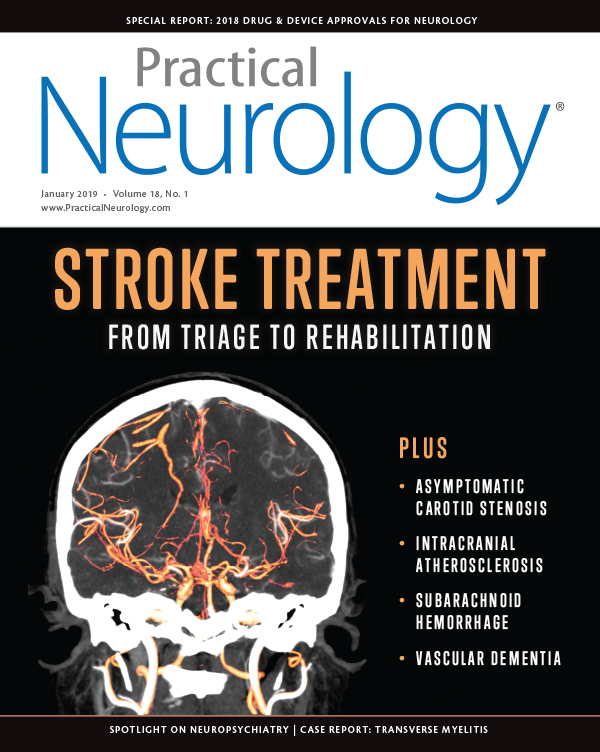 Optimal secondary stroke prevention includes reducing modifiable risk factors and providing anticoagulation for specific indications.